Due to his controversial and unique methods in handling the predators, Richardson has solely pioneered a new way of interacting with Africa’s apex predators that almost defies belief. He has dedicated his entire adult life to protecting these beasts and also conserving the nature. A shot of one of countless interviews of Richardson. Image Source. His rise to stardom due to his highly dangerous career has allowed Richardson to be an international icon and forefront in his conservationist efforts. In his documentaries, he states that despite all the efforts that he has undertaken, even the predators under his care are not that well to do. Due to the financial constraints, Richardson has had to put contraceptives in the female predators to stop breeding as he simply has no resources to feed. Sometimes, the meals for lions are from farms which send dead domestic animals and even the commercials and documentaries do not bring in enough revenue. Richardson with film crew, filming the lions. Image Source. Starring alongside his predators in many astonishing documentaries, Richardson has managed to dismiss countless myths about the predators and the wildlife in Africa. Using media as a global platform, he raises awareness about the poaching of lions, pollution of the land, and the never ending problem of the expanding human population all of which are significantly damaging and destroying the nature that is left. He even wrote a book and produced a movie in hopes of trying to garner support for his cause. 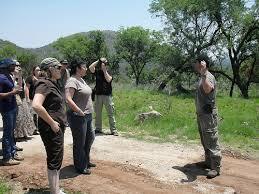 Taking care of his own sanctuary is not the only conservationist effort that Richardson has taken part in. 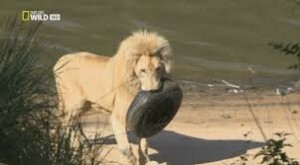 Every few months, he heads down to the nearby rivers with volunteers to clean them out of dumped waste and pollution, sometimes reusing the dumped tires as “chew toys” for his lions. One of Richardson’s lion, Thor playing with a tire. Image Source. He also runs volunteer programmes which allow people from all around the world to come down and help around the sanctuary, experience and take part directly in his conservationist efforts. The volunteers help out in the sanctuary but are warned from venturing near or interacting with the predators as a safety measure. Richardson talking to a group of volunteers. Image source. 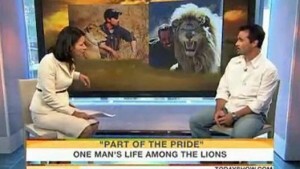 He has sacrificed a lot for his cause of protecting the wildlife in Africa. While promoting his cause to the international community, Richardson also admits that he has often neglected his own human family. He states, “2009 was a year of many overseas trips to promote both my biography and White Lion. It was difficult going to all these countries without Mandy, because I would really have liked to share the experiences with her.” Not only then but in daily life as well, as using his method of interaction with the predators is not only dangerous but also very time consuming as well. Some of his other efforts also include joining other conservation groups in directly lobbying against the South African government to protect the wildlife, raising awareness through fundraising and social media campaigns to the issues, giving seminars across many countries and working with wildlife NGOs, most notably Protecting African Wildlife Conservation Trust.